In this post, I briefly announce the release of bowerick version 1.99.17. Compared to the next post I have planned, this is not the chronological but the, in my opinion, logical order. Enable heartbeat for Web Socket (WS) client connections. Add simple examples for connecting to the broker from a web browser. Having a heartbeat for WS client connections avoids disconnects due to timeout when using bowerick as WS client. The default values (10000 in ms) can be overridden by re-binding the *ws-client-ping-heartbeat* and *ws-client-pong-heartbeat* global dynamic variables. In addition, I added two simple examples for using Message-oriented Middleware WS connections from a web browser. Playing with these examples actually was what motivated me to add the WS client heartbeat as the timeout disconnects became a little annoying over time. In the next post or posts, I plan to write about the WS web browser examples. I hope bowerick is useful for you. I am happy about any constructive feedback and criticism. The video was uploaded already quite some time ago. However, I still want to put a link on my blog to have all references in a common place. The slides of the talk can be found in an earlier post. Once more, many many thanks to everyone involved in :clojureD: organizers, attendees, speakers, and everyone else. :clojureD was a fantastic experience as speaker, as attendee to the other talks, and as part of the many great conversations with the very nice people around. As my last post about test2junit is some time ago, here is the very brief description: test2junit is a Leiningen plug-in that provides improved JUnit XML format output when executing clojure.test tests. In addition, it allows to automatically run the corresponding JUnit Report Ant task for generating HTML from the XML output. An example is available on the test2junit repository. Include System Properties in output. Include Stdout and Stderr in output. Some minor improvements to the output structure. With the fix to issue #10, the file and source code line at which a problem occurred are properly shown. It turned out that the culprit was just a wrong index. Thanks a lot to Andrew for spotting and reporting the issue! System Properties of the JVM executing the tests are now included. Before just nothing was emitted for this part of the XML. An example for how this looks can be seen in the example output by scrolling to the bottom and clicking on “Properties”. Furthermore, Stderr and Stdout are also included in the XML output. An example for how this looks can be seen in the example output by scrolling to the bottom and clicking “System.err” or “System.out” respectively. The content shown for “System.out” actually includes Stderr as well. The reason for this is that I think it would make reading the output more complicated when Stderr and Stdout are separated into two different outputs. It would be, e.g., more difficult to related messages from Stdout and Stderr to each other. The output for “System.err” only shows Stderr. This makes it easier to check for important output from Stderr. One potential drawback of including Stderr and Stdout in the XML output is that the output has to be redirected for capturing it such that it is not printed in real-time in the console right now. To accommodate this, the output is printed after collecting it. This has two consequences: instead of being printed in “real-time” the output is printed in batches after the capture of one unit of output was done. In addition, Stderr and Stdout are both printed to Stdout. However, so far, I did not encounter negative effects of this in practice yet. I hope that you consider the changes useful. In case you have comments, requests, or other feedback, it would be great if you send me your feedback. I actually uploaded clj-net-pcap version 1.7.1 quite some time ago. Unfortunately, I was very busy and couldn’t even write an announcement. In this post, I briefly announce the clj-net-pcap version 1.7.1 release. My motivation for these changes was to provide a better live demo of clj-net-pcap. With the latest cli4clj version, the interactive command line interface (CLI) offers more convenient functionality. With the stderr-forwarder-fn, the output printed for each packet is printed to stderr instead of stdout. By redirecting stderr to a named pipe or file, it is now possible to use the interactive CLI without the CLI being flooded with the packet output. This, in my opinion, eases the use of clj-net-pcap for simple experiments or demonstrations a lot. Below, a screenshot of a demo setup is shown. 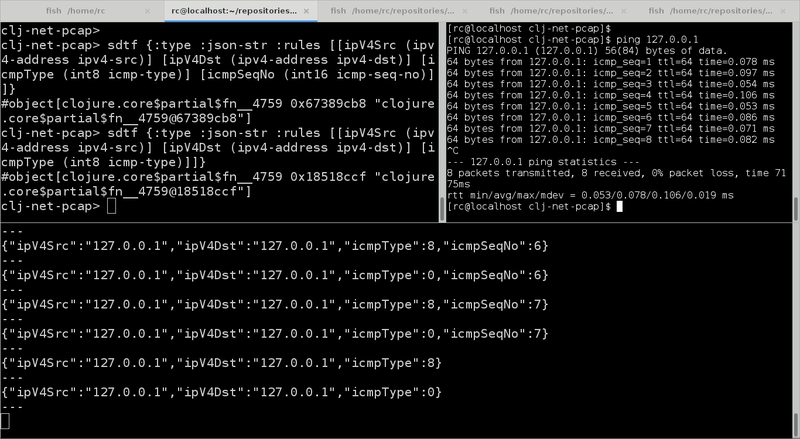 On the top left, the clj-net-pcap interactive CLI is shown. On the top right, another shell is shown that was used to generate traffic via the ping command. On the bottom, the output from the named pipe to which the stderr output was redirected is shown. The remainder of the example as shown in the screenshot above is simple to print what is written to the pipe via “cat” and to generate the traffic via “ping”. I hope that this will be as useful for you as it was for me. Comments etc. are, as usual, highly appreciated. Thanks. Packet Capturing with the JVM and Clojure – Yes, we can! This post is a somewhat extended “Note to Self” in the sense that some of this may also hopefully be useful for others. I like LaTeX a lot and its “listings” package is great for including source code in documents. However, while the source code typically looks good in the generated documents, there are problems when copying and pasting the code from the listings. Typically, one of the reasons of providing a code example is that someone can reproduce certain things. Hence, it would be great if it was possible to directly copy and paste code from listings generated with LaTeX to a source code file or REPL. Unfortunately, there are some issues related to this. At first, I will show a minimum working example for illustrating the problem. Afterwards, I show a minimum working example with the solution I use so far. The current “solution” is based on various things I could find on the Internet and merging all the bits and pieces. Actually, when searching for “LaTeX” and “lstlisting” and “copy paste” or “source code” one can find many posts, questions, etc. with all sorts of answers. Clearly, this cannot be used for pasting it into a source file or the REPL. The most obvious problem is the spacing of characters but there are also issues related to quotation marks etc. Besides the indentation not being correct, this is actually something that can be run as-is in a REPL or be used in a source code file. The credit for the solution goes to all the helpful posts on this topic. As I had to merge various solution approaches from multiple posts and play a bit with all the input before coming to the above “solution”, I, unfortunately, did not keep track of the references that led me to this state. So I just go with a general “thank you” to the nice and helpful LaTeX community. First of all, for those who did not run across bowerick yet, here is a brief description: bowerick is a Clojure library that bundles the functionality of various Message-oriented Middleware (MoM)/Java Message Service (JMS) implementations and provides one centralized abstraction for these. It currently supports Stomp, OpenWire, MQTT, and Stomp via WebSockets. You can find more information in other posts I wrote about bowerick. In this post, I briefly discuss how bowerick, which is written almost entirely in Clojure, can be used in Java. In a sense, this completes a full circle as most (all? But I did not double-check that.) of the MoM/JMS libraries employed in bowerick are Java-based. In this part, I present some Java code snippets etc. for using bowerick in Java. Here, I write about some measures I took in order to allow/ease Java interoperability. In order to demonstrate the use of bowerick in Java, I created a simple example project on github. The example project was set up as Maven project in which the examples were implemented as JUnit test cases. In this section, I will present some snippets of this project. Note that producers and consumers have to be closed when they are not needed anymore. Producers and consumers implement AutoClosable such that they can also be used, e.g., in corresponding try-catch blocks for auto closing the created instances. Furthermore, the consumer example includes a bit more surrounding code in order to demonstrate the use of the received data. Instead of Strings, more complex data structures, such as Java lists, maps, or sets, can also be sent via these mechanisms. Even though I primarily use bowerick in Clojure, I also tried to implement it already with Java interoperability in mind. In this section, I will outline the aspects that I consider important in this context. Clojure offers, in my opinion, excellent Java interoperability such that it is very easy to write Clojure projects that can also be used from within Java. However, in scope of bowerick, I came across some things that I found helpful. In bowerick, consumers and producers are not just pure functions. In fact, a producer, e.g., has to provide functionality for sending data and functionality for closing and freeing its resources, namely the JMS connection. Hence, there has to be some way for dispatching between these two functions. For bowerick, I chose to define producers and consumers as records and to pass the send and close functions as constructor arguments to these records. Personally, I think that this can be an example for a symbiotic co-existence of Java and Clojure. My personal impression is that using Clojure helped me a lot during the development of bowerick and that making bowerick available in Java can benefit on the Java side as well. However, this is just my very subjective impression without any real hard figures to “prove” it. Regarding the current Java interoperability implementation: I use Object as type in some places, such as the JmsController constructor or the JmsConsumerCallback processData method. For the JmsController, currently supported argument types are, String or List. For the processData method, the type strongly depends on the data that was sent and how it got de-serialized. However, Object being somewhat the NULL pointer equivalent of Java, using just Object breaks the benefits of static typing and requires casting etc., which may be considered disadvantageous. I hope that this is useful for some. Feedback, comments, and constructive criticism, are always appreciated. In my previous posts, I primarily focused on cli4clj itself and on CLIs created with cli4clj. In this post, I want to address a bit the applicability of the cli4clj unit testing functionality for testing “third-party” CLIs. I will do this by showing how to easily unit test the Clojure REPL with the cli4clj unit testing functionality. As examples for illustrating the working principles in this post, I will use the source code of unit tests that I recently added to the cli4clj repository. The examples will start simple and will be enhanced step by step in order to provide a hopefully fluent and clear line of argumentation. In the examples, the input commands will be stored in the “in-cmds” vector, which represents the sequence of inputs that are consecutively entered into the REPL. The output is stored in the “out” var. The expected output that will be emitted is shown as the expected string value in the “(test/is (= “expected string” out))” expressions. This example illustrates the basic capability of executing the Clojure REPL with cli4clj. One annoying property is that the REPL prompt output “user=> user=>” will clutter up the output. The problem of the REPL prompt cluttering up the output will get even worse when the complexity of the considered scenarios increases. (let [in-cmds ["(def x 21)"
Instead of the expected result string, as used in the earlier examples, this example uses “cli-tests/expected-string” to build that string. “cli-tests/expected-string” simply takes care of inserting the proper line separator in between the strings given to it in the argument vector. The example demonstrates that the REPL works as expected. A var can be defined, used, and println outputs the string an returns nil as expected. However, there is one peculiarity that may not be obvious at first but may become critical later. In this example execution, the var “x” is defined in the “user” namespace and the namespace is hard-coded in the expected string. Under certain circumstances, e.g., when running the tests with “lein cloverage”, however, the namespace in which “x” will be declared will be different and thus the test will fail. In this example, the hard-coded string “#’user/x” was replaced with a dynamically constructed string based on “*ns*”: “(str “#'” *ns* “/x”)”. I tested this version with “lein test” and “lein cloverage”. Last but not least, I also show the use of the recently added string-latch. The string-latch can be particularly useful for “stepping” through the execution of a test. In this example, the string latch is used to set the atom vars “val-0” to 2. The vars are set to the vector of strings that were so far observed by the string-latch “sl”. It can be seen how the strings accumulate with increasing val-x index. Please note that the namespace was not hard-coded but that the approach using *ns* was used. Furthermore, note that the string latch also contains the new-line characters, which are matched via the cli/*line-sep* placeholder. In this post, I used the Clojure REPL as example to show that the unit testing functionality provided by cli4clj can also be used for testing more interactive CLI applications than ones created with cli4clj. So far, I did not encounter limitations such that from my current point of view, it should be possible to test any interactive Clojure CLI application with cli4clj. I hope that you consider this post and cli4clj useful. As usual, constructive feedback, criticism, and comments are always welcome. In my previous post, I already outlined the problem of testing multi-threaded interactive command line interfaces (CLIs). In the meantime, I came up with some improvements for addressing the testability of multi-threaded command line applications with cli4clj. and an enhanced string-latch with callback functions. (let [test-cmd-input ["add 1 2"
The async-cmd-not-finished-test will typically fail. The reason for this is that the execution of async-test-fn spawns a thread in which the “actual processing” (mimicked via utils/sleep) is done. The main CLI UI thread, however, is not aware of this thread and thus only blocks until the test function has terminated. Consequently, cli-tests/test-cli-stdout will typically terminate before the processing thread has finished. Thus, the output of “Finished.” will typically be not included in out-string such that the test will fail. Even worse, this can result in a race condition with seemingly random behaviour in which tests pass sometimes and sometimes not. The stop-gap solution introduced back then was to use a hidden _sleep command to cause the main CLI UI thread to wait until the processing thread had finished. However, using sleeps for this kind of use case is not a good solution. In order to improve the testability of multi-threaded CLIs, the execution of non-UI threads has to be synchronized with the test-execution of the main CLI UI thread. As this is about CLIs, one natural option for this synchronization is to use the CLI output for synchronization. In the end, even the execution of multi-threaded functionality in an interactive CLI can be typically expected to cause some sort of CLI output. In comparison to the problematic test async-cmd-not-finished-test, the changes are: the addition of the string-latch “sl” and the use of the test-cli-stdout that takes the string-latch as argument. In this post, I briefly introduced the string-latch for testing interactive CLIs and its most important features. I think the string-latch is an important improvement in comparison to the previous _sleep stop-gap solution. For my use cases, the string-latch works very well so far. I hope to get the time to write a bit more about the details of the string-latch in future posts. As usual, you can get the latest version of cli4clj from clojars.org and I would be happy if you left some constructive feedback or comments. cli4clj is a library for easing the implementation of simple interactive command line interfaces (CLIs) for Clojure applications. In this post, I briefly announce the release of cli4clj version 1.2.3. Add support for hiding commands in help and completion. Hidden commands are prefixed with “_”. Hide the “enable-trace” command by changing it to “_enable-trace”. Add a hidden “_sleep” command. For hiding commands, the convention of prefixing hidden commands with “_” was introduced. This means that all commands that begin with an underscore, “_”, will neither be shown in the help nor in the command completion. The rationale for hiding certain commands is to improve the usability by removing everything a “typical” user does not need. In this process, I also changed the “enable-trace” command to “_enable-trace” in order to hide it from the user. The “_sleep” command was added as a stopgap solution for testing multi-threaded CLI applications. The current CLI test functionality works very well. However, there is a problem with multi-threaded applications. Clearly, when a command triggers interaction with another thread that eventually prints a result, a corresponding unit test needs to wait until the processing finished and the result was printed. The CLI “UI thread” however, cannot know how long it has to wait. Thus, I added the “_sleep” command as a simple stopgap solution. Actually, using sleeps for this is not really an ideal solution. However, for now, this approach serves its purpose. In future, I may come up with something better that still allows me to keep cli4clj simple. As usual, constructive criticism, feedback, and comments are always appreciated.